One of my favorite Farmer’s Market buys of this summer has been nectarines. Every week I anticipate the large piles of scrumptious white and yellow varieties along with the fuzzy skinned peaches to choose from so I can enjoy them with my yogurt and add them to my breakfast smoothies. My latest smoothie addiction has been my newest creation, The Green Nectarine. I’ve always liked fruit with my greens. Fruits such as strawberries, pears, peaches and grapes compliment salads to create sweet and savory flavors. You can also combine fruit and greens into smoothies. It’s a great way to gain several nutrients in one serving. This smoothie contains spinach, one of my daily smoothie green add-ons. Beware that spinach does not compliment every fruit smoothie. So far I’ve experienced that strawberries and blueberries are best without. Fresh mint or basil adds amazing flavor to this combo. I can’t decide which I like more so I rotate between both depending on which herb I’m in the mood for. You will notice that hemp seeds are an optional ingredient. If you are not familiar with hemp seeds they are a super food plant protein that contains all 10 essential amino acids. Their flavor is very mild and you can add them to almost anything. If you prefer not to add hemp seeds you can substitute with chia or flaxseeds for an added health boost. If you are looking for a dairy free version of this recipe, skip the yogurt and add 1 ripe avocado instead. Avocados make for a creamier and more filling consistency that will keep you energized. 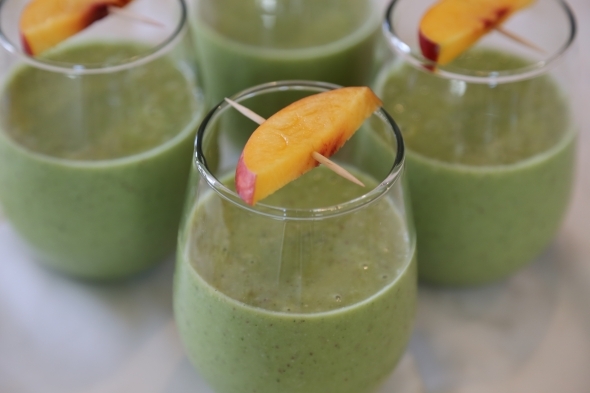 You never knew fruit and greens could taste so good together until you’ve tried this delightful smoothie! Place orange juice, cashews, nectarines, bananas, yogurt, hemp seeds, spinach, mint or basil and ice in that order in a blender. Blend on high speed until smooth (using tamper if needed); add agave nectar for additional sweetness if needed. Note: All ingredients may be adjusted for desired consistency and flavor. If substituting yogurt with avocado, smoothie will be thicker and you may want to lessen the amount of ice.